Mantis 360 Pro is everything you need to make your 360º/VR video come to life. The system allows for an extremely steady 360 moving shots. 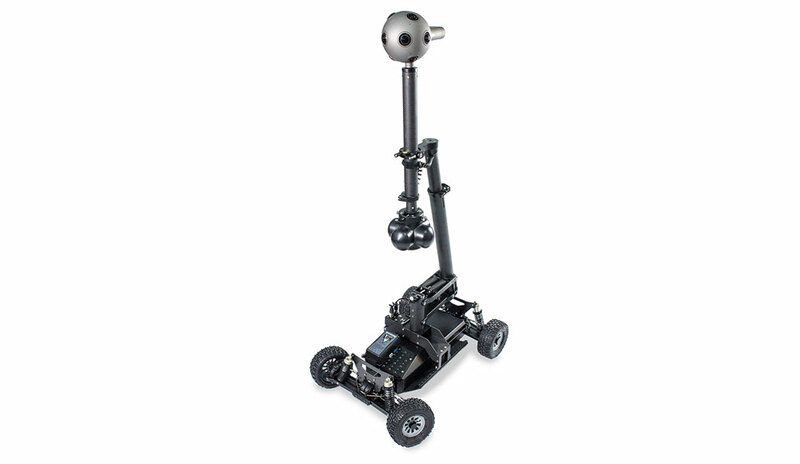 It’s the best robotic dolly available on the market for 360/VR applications. A custom vibration isolation system and gyro stabilisation system allows silky tracking shots with a super small footprint within the equirectangular panorama. The Mantis 360 Pro by Motion Impossible is the world’s first solution to remotely move and stabilize 360⁰ cameras on the ground. It is a fully modular system that combines with your camera and gimbal to create the ultimate tool for remotely moving and stabilizing your 360 VR camera. With an operating range of up to 300m/1000ft and a quiet electric motor system you can drive your camera in to difficult filming areas, generate on the spot shots with no set up times. Vibration Isolation – Advanced suspension system ensure amazing shot stability, even in the most demanding environments. Gyro stabilisation system, always steady and reliable. FPV camera system allows the operator to control the mantis out of sight. Finally the operator is not in shot!